In deciding to name her latest album, "Bring Joy," Chicago pianist Jo Ann Daugherty hopes the album will do just that. Daugherty will celebrate the release of the album by performing at 8 p.m. and 10 p.m. Jan. 31 at Jazz Showcase, 806 S. Plymouth Court, Chicago. The free show is part of the monthly WDCB Night at The Jazz Showcase. I had the chance to talk to Daugherty about the new album. Q - Great talking to you. Of course, you have a new album, "Bring Joy." What were your goals for the album and do you think you accomplished them? Is there a meaning behind the album's name? Thanks for your questions! Yes, the title, "Bring Joy," really does reflect the musical goal of the album. I set out to make a collection of tunes that invites hanging out and listening - you know, music that just feels really good. In that respect, I think we’ve met that particular goal. Q - You've also been involved in Broadway shows such as "Seussical," "Dreamgirls" and "Billy Elliot" as well as music-directing and arranging PBS concert specials. What did those experiences teach you? Do you feel you need to be involved with such projects rather than just writing and performing on your own? My time with both “Jersey Boys” and “Motown: The Musical” probably got even more deeply into my head, as my involvement with those two was much more extensive. Those experiences with major productions taught me more than I’ll ever fit in a paragraph! As a musician, these kind of shows in general involve a very specific kind of preparation and attention to detail. Conducting and music directing both exercise a very different part detail-oriented of my brain and ears, which I greatly enjoy. Probably the biggest lesson, though, was this: seeing 1,000 people enter the theater every night with the weight of the world on their shoulders and leave transformed by the experience was a big reminder in how music can really touch people’s hearts. I feel enormously lucky to be involved in so many types of music and work. It’s not so much that I feel a “need” to be involved there—I just kind of follow my heart and go where opportunities take me. Q - You were previously part of the Kansas City jazz scene. How does the scene there compare to the Chicago jazz scene? The Kansas City jazz scene was an amazing place for me to get started. The world class players were very accessible to the up-and-comers, so I got to learn from some wonderful players. Musically, the tradition there really focuses on swinging, what a gift. It was also a great place to get my skills together in terms of being a working musician. At the time I left in 1998, I was seeking to be part of a bigger community and ended up in Chicago, which has been great for me. But Kansas City will always hold a special place in my heart. And their scene now, since Bobby Watson has been attracting and nurturing lots of talent through the jazz program at UMKC, is pretty amazing. As for Chicago—I continue to be blown away by how many great players in different genres are in this city. Q - What do you think you have brought to the jazz scene? What did you learn from people like Kansas City musician Tommy Ruskin? I love that these two questions are together. What I learned from Tommy Ruskin pretty much lines up with what I hope to bring to any scene: solid musical skills, a great attitude, and a willingness to work hard and get better. Q - You are a founding member of the Chicago Jazz Composers Collective. I know the collective has put on concerts over the years. What made you want to form the collective? Do you think it has helped bring the music to more people? We were inspired by similar groups elsewhere to present a series of original music - both to provide a platform for performing original music, and to facilitate exchange of ideas among local composers. Going out on the road eventually took me out of involvement with the group, but they’re still putting on concerts 15 years later. So I definitely think they’re reaching people! And thanks for the reminder to reach out to them again. My life of roaming through different types of music and work makes it too easy for me to lose touch sometimes. Q - Who would you consider your main influences and how have they influenced your music? Herbie Hancock, Stevie Wonder, Wynton Kelly, Keith Jarrett, Abdullah Ibrahim, Pat Metheny, Earth Wind and Fire…I could go on and on, and the list would just start to look stranger. The thread in all of this is that “joy” thing again. I’m really drawn to music that has energy and buoyancy, even (or especially) in the pieces that aren’t especially joyful. I’m not looking for one constant note of happy optimism, but I am definitely drawn to a particular sort of energy. Q - You started studying music when you were five years old. Do you think that is easier to learn music at a young age? What advice would you have for a budding musician? I was so lucky my parents were willing to take me to lessons. We were out in the country, so everything was far away and required some effort. They put in that effort and expense over so many years, and for that I’m deeply grateful. Sure, music is easier to learn at a young age, but I’m still learning now too. For a budding musician I would say: learn your craft deeply, be flexible in what you can play and do, and be a kind human. All of these things have helped me greatly on my path. Short term goals include sharing the music from this new album with a wider audience and starting on another one soon. Long term goals are to take my own advice to budding musicians: continue to learn my craft deeply, be flexible in what I can play and do, and be a kind human. 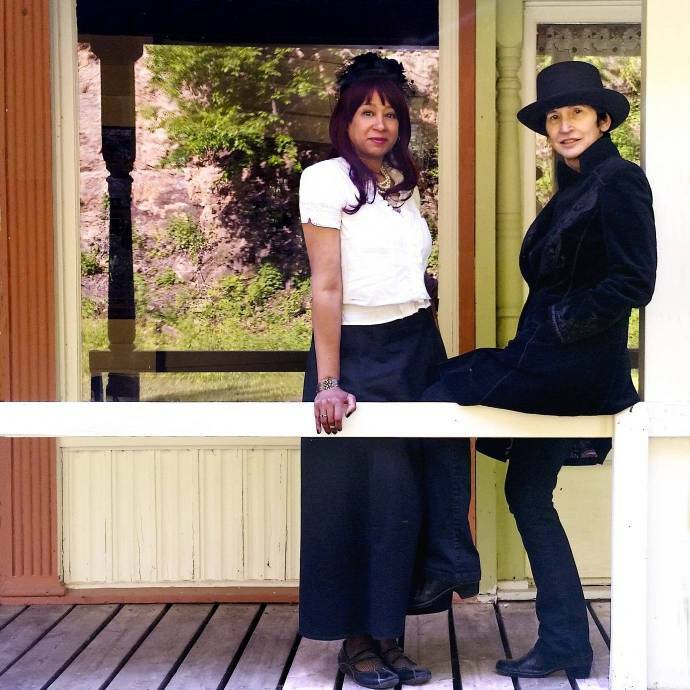 Susie Lofton - This album has the first co-write for us, "Box Canyon Blues," however most of the previous album’s material is Amy’s writing and my contribution has been the harmony voicing and percussive accompaniment. Since then, however we’ve added a song or two to our repertoire that I wrote. We spend a lot of time together and are always discovering new colors in the writing process. I was so smitten by the singer songwriter style. The art of the story. The beauty of harmony. I love the intimate space it allows for that I haven’t too often found in other genres. Real feelings. Real people. There always has been and always will be singer/songwriters. Music trends ebb and flow, but singer /songwriters are a constant in American music. Whether it's folk, gospel, blues or rock, it’s the story of America.